Previously, the network at the City of Lake Wales didn't possess any firewalls, intrusion protection or web filtering solutions. As a result the network, which is spread out to multiple locations (including law enforcement), was left wide open to security breaches and caused system performance problems as users unwittingly picked up spyware and malware. Since there are several City locations, a security solution needed to be flexible enough to be customized for each site. 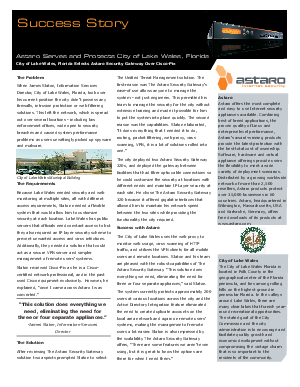 Download this free case study and read how a Cisco-certified network professional was converted and picked the Astaro Security Gateway over Cisco-Pix.